What a remarkable few days of football we've had. 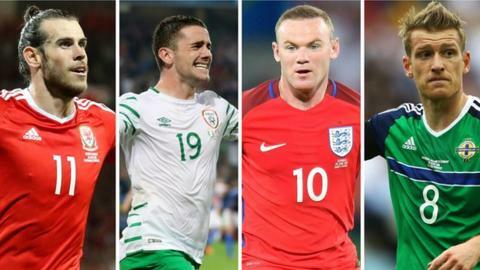 It's great to see England, Wales, Northern Ireland and Republic of Ireland all through to the knock off stages of Euro 2016. Some failed to dazzle on their way there (England as per usual!) while others really gave it their all. I must say that the performance on Wednesday by the Republic of Ireland against Italy really was the cherry on the cake. Talk about leaving it all on the field. The celebrations afterwards from the fans made for such a great sporting moment. It would be amazing to see all four teams make it through the first round of the knockouts, but aside from being very unlikely in normal circumstances, it's impossible due to the fact that Wales and Northern Ireland are due to meet. That's a pity in one sense, but on the other hand at least one of them will be progressing to at least the quarter finals and in the easier side of the draw too! England are in the other side of the draw and have some tough games down the line if they can overcome the tournaments surprise package, Iceland. No doubt the patriotic pound will find its way to people lumping onto England at 4/7, but for impartial observers the real dream result would yet another Republic of Ireland win, this time against hosts France. Of course that can't be said to be particularly likely, but we can dream. No bets for me this time around, I'm just enjoying the tournament!